Historical records indicate that the ancestor of the Jingpo ethnic group has a close relationship with the Qiang and Di people. They used to live in the southern mountain area of the Xikang-Tibetan Plateau. Later, they gradually migrated to the northwestern Yunnan Province, west of the Nujiang River. The local people, together with the newly arrived Jingpos, were called "Xunchuanman" (Xunchuan Barbarian). In the 15th - 16th century, aiming to avoid the warfare, they continue to move west and finally settled down in the Dehong area, living together with the Deang, Achang, Lisu, Han and other nationalities. They have been variously known as the "Echang", "Zhexie", and "Yeren", since the Yuan Dynasty. With the founding of the PRC in 1949, following consultation with the ethnic group, it was decided to agree upon the official name of Jingpo ethnic group. 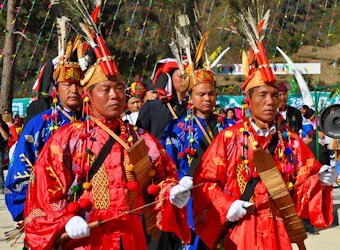 The Jingpo people have their own language that belongs to the Tibetan-Burmese family of the Chinese-Tibetan language system. An alphabetic system of writing based on Latin letters was created and introduced to the Jingpo people about seventy years ago however, is not as popular as Han language. The Dehong Region like Xishuangbanna Region hosts many minority groups, but the most obvious are the Burmese, Dai and Jingpo. 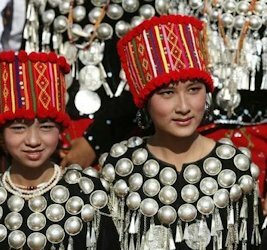 In Burma (Myanmar) the Jingpo are known as the Kachin, a minority long engaged in armed struggle against the Myanmar government. 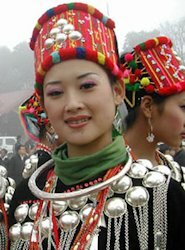 The Jingpo are found in Yunnan Province on the Burma border. They speak a Tibeto-Burman language closely related to Drung. Their main traditional religion is polytheism, but some practice Christianity.